Pune is one of the few cities in the country that regularly and promptly publishes its annual budget on its website. Pune NGOs Janwani and Parisar have analysed the budget and published the analysis so that everybody can get a better idea of where our tax money is being spent. 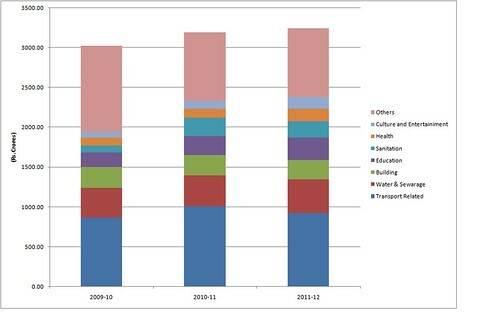 You can also check out Parisar’s analysis of the budget. Overall, while Pune gets good marks for making the budget available to the public, apparently, the budget is not easy to understand, and making sense of it requires a significant amount of further processing. Parisar has done exactly that. Now the next step is to convince the authorities to publicize how the money is actually spent (as opposed to how they had planned on spending it). From 5 to 8 December, Pune will play host to a very high powered conference on education, featuring some of the top names in education from India and US. And by top names, I really mean the top: everyone’s listed as speakers and panelists, from ministers (Sharad Pawar, Vilasrao Deshmukh, Sushilkumar Shinde, and others), Governors, bureaucrats (from planning commission, AICTE, UGC), heads of various universities and colleges too numerous to mention (including Kadam, DY Patil, Navale, Karad, Mujumdar – all the big names in Maharashtra’s higher education), and a whole lot of others. The conference is organized by three organizations: Alliance for US India Business (AUSIB), State Legislative Leaders Foundation (SLLF), and Dr. D Y Patil University. For more details, see the AUSIB website. You can register for the conference here. It costs Rs. 5000 per person. Will Pubmatic be Pune’s First Software Product Company IPO? Online ad optimization platform maker, PubMatic, which is developed wholly out of Pune, has just hired Steve Pantelick, a CFO who specializes in preparing companies for an IPO, reports VC Circle. Earlier, Business Insider ran a story claiming that Pubmatic had gotten an offer of $300 million from Amazon, but turned it down in favor of going for an IPO. PubMatic acquired ReviNet, a US-based advertising optimisation company in May this year. It recently expanded to Europe and launched more data management and mobile products. Its GAAP revenue has risen 33 times in the past two years and by 51 per cent between the second and the third quarter of this fiscal year. While Pubmatic is technically US-based, it has two co-founders who are in Pune (Mukul Kumar and Anand Das), and all of its development happens in Pune (with the exception of the ReviNet acquisition). If Pubmatic does indeed go for an IPO, it will the first mostly-Pune-based software product company to do so. While last year’s Persistent IPO was many years in the making, Pubmatic is just 5 years old, and will be a great source for inspiration for technology startups in Pune. Two emerging cleantech companies with very strong links to Pune have made us proud recently. I am sure ‘PK Clean’ and ‘First Energy’ will add to the likes of Praj, Suzlon, Thermax etc, companies that are worldwide leaders in CleanTech and call Pune their home! No other city/industrial cluster in India can boast of this distinction! In another little news, I’m sure a harbinger of more great news to come, Pune-originated ‘Carbon Clean Solutions’ (or CCS for short) was recently invited to attend World Economic Forum. Looks like tomorrow’s great cleantech companies have two things in common (besides strong technologies and founders): they have very strong Pune links and they all have ‘at-least-two-word-names-with-spaces-in-them’ 🙂 Maybe CCS should relocate back to Pune, they have a leg up with a three-word name! Hint, Hint, Aniruddha Sharma! The gap between what our engineering colleges produce and what our industry would like to consume is widening, and will become an increasingly severe problem for the health of the software industry in India. Everybody realizes there is a problem, and there are lots of people working on this issue from various angles. Entrepreneurs are rushing in to fill the gaps, educators, especially those in independent institutes are trying interesting new experiments, and social media has the potential to change everything. InnoVidya is a platform that aims to bring together the people at the forefront of this revolution. On November 26, we invite you to the first InnoVidya event – where the speakers will include Dr. Anil Sahasrabudhe, Director of CoEP, Mohit Gundecha, CEO of hot and recently funded startup, YourNextLeap, and Arun Prabhudesai, CTO of My Open Campus, a startup that aims to change how students interact with everybody. But the excellent line-up of speakers is not the main reason to attend this meeting – come for the audience: trustees of colleges, directors and HODs of educational institutes, heads of software companies who are desperately searching for solutions, and other Pune entrepreneurs who are looking to get rich as the Indian education system is forced to transform itself by inexorable global changes. This is a free and open event, on Saturday, November 26th, from 10:30am to 12:30pm, at Venture Center, NCL Innovation Park, Pashan Road. Please register here. followed by free time for hallway conversations. Anil is the Director of College of Engineering Pune (COEP). Anil joined COEP as the director in 2006. He holds a vision to take COEP to the next level with a view to enriching the life of every student who enters COEP. Anil will talk about the changing scenarios in higher education in India. Anil did his BE Karnataka University (Gold Medalist) and has a PhD from IISc Bangalore. In the past he has been a researcher at IISc, faculty at NERIST, Itanagar, and Professor at IIT Guwahati. Mohit is the CEO & Co-founder of YourNextLeap. He was an early team member and head of India Operations for mig33, a mobile community with more than 50 million users. Prior to mig33, Mohit studied at Stanford University, where he co-founded Mobile Momentum with Prof. Tom Kosnik. Mohit has also co-authored a widely referenced mobile industry report, ‘Future of Mobile VAS in India’. My Open Campus brings seamless collaboration to colleges, communities and closed user groups . MOC aims to bring all stakeholders (for e.g: students, faculties & administrators in a college) on single easy to use unified platform, where they can communicate and carry out all regular activities online. MOC offers secure messaging, online assessments & exams, Information repository, student & Alumni groups, event management, Student database management, discussion forums, placements along with host of other features.. The vision of My Open Campus is to create employable intelligent students. There cannot be knowledge enhancement in an isolated and restrictive environment. Hence MOC brings together all stakeholders on a single platform to make learning a fun & social activity. Arun is the CTO of Enhanced Education, the company behind MyOpenCampus. Having worked for over 15 years in I.T Industry across the globe, Arun returned back to India to pursue his dream of starting on his own. He has been quite active in Startup and Entrepreneur community is always in forefront in advising upcoming Entrepreneurs. This event is free and open for anybody to attend. Please register here. And join the InnoVidya mailing list (optional).